Evalan’s bGrid system has been installed in the offices of Microsoft at Schiphol Amsterdam Airport. 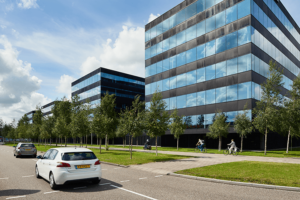 This innovation will turn the building into ‘a type of smartphone that allows for the installation of apps’, according to Jan Willem Weissink, the director of Schiphol Real Estate. One of those apps is MAPIQ, which enables users to find each other in the building, to locate empty desks and to book meeting rooms. With this smart technology Microsoft wants to lead the way to office environments that are geared towards “activity based working” – a new way of communicating and networking. Computable recently wrote about this projecy – see Smart Airport City.